2. Repeatedly tap any item while looking at the selected hotbar slot. 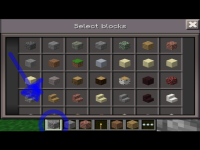 You will see the item in the hotbar slot flash white repeatedly; however, the right most pixel of the hotbar slot does not flash and the left most edge of the flashing white box overlaps the left edge of the white outline of the selected hotbar slot.